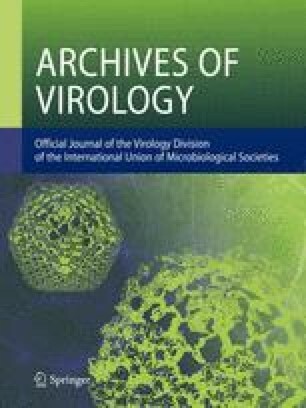 Two isolates of a novel babuvirus causing “bunchy top” symptoms were characterised, one from abacá (Musa textilis) from the Philippines and one from banana (Musa sp.) from Sarawak (Malaysia). The name abacá bunchy top virus (ABTV) is proposed. Both isolates have a genome of six circular DNA components, each ca. 1.0–1.1 kb, analogous to those of isolates of Banana bunchy top virus (BBTV). However, unlike BBTV, both ABTV isolates lack an internal ORF in DNA-R, and the ORF in DNA-U3 found in some BBTV isolates is also absent. In all phylogenetic analyses of nanovirid isolates, ABTV and BBTV fall in the same clade, but on separate branches. However, ABTV and BBTV isolates shared only 79–81% amino acid sequence identity for the putative coat protein and 54–76% overall nucleotide sequence identity across all components. Stem-loop and major common regions were present in ABTV, but there was less than 60% identity with the major common region of BBTV. ABTV and BBTV were also shown to be serologically distinct, with only two out of ten BBTV-specific monoclonal antibodies reacting with ABTV. The two ABTV isolates may represent distinct strains of the species as they are less closely related to each other than are isolates of the two geographic subgroups (Asian and South Pacific) of BBTV.